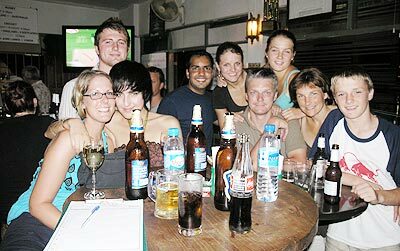 The new Bar-Tender recently opened at Talad Boon Yoo, and is already attracting loyal regulars. 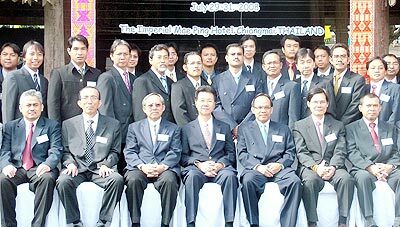 The Imperial Mae Ping was the chosen venue for a recent meeting chaired by the Electricity Generating Authority of Thailand’s deputy governor, Rattanapong Jongdumkueng , seated 4th from the right amongst executives from ASEAN member countries. 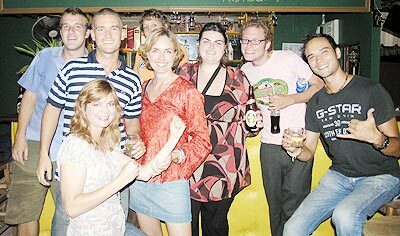 ‘Elizabeth’s Barmy Army’ competing at the UN Irish Pub’s quiz night last Thursday. 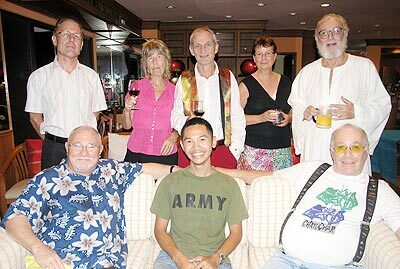 A smaller crowd at the regular opera evening at Rimping Condo. 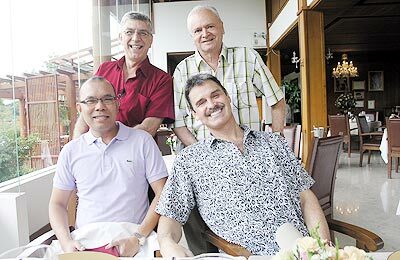 Guy and Alan (standing) welcome Kevin and Michael (seated) to the city by treating them to a meal at Le Crystal Restaurant. 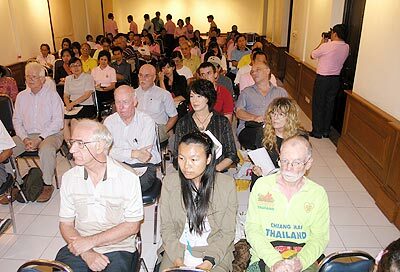 Pictured are some of the farang “concerned citizens” of Chiang Mai attending the Mayor’s regular monthly meeting. Chantrakarn Jewellers—two young Chiang Mai-born guys, Chan and Karn, who have been in business for 4 years and have built up a considerable reputation for their unique and finely crafted Thai –style jewellery. Chan is the designer, getting his inspiration from the stones themselves—with a little help from “celeb” magazines and the TV! Formerly in hairdressing and teaching, their large stall is at Airport Plaza, Zone A, in front of Northern Village and near Make-Up Studio. If you don’t know your birthstone, they can help, both on Zodiac signs and the weekday of your birth. Chantrakarn is often asked to provide jewellery for fashion shows and special city events, such as at the Fashion Show on August 27 at the Shangri La in aid of the Rooftop Party Charity.